1980 found Yes on the verge of collapse and a nervous breakdown. Jon Anderson had not sang an impressive note since 1974's Relayer, Rick Wakeman started to make fans fall asleep, the last sessions of Yes featuring Jon Anderson and produced by Roy Thomas Baker (Queen, Cars) didn't work at all. Dead end for one of the most important progressive bands in England. Like AC/DC, on the same year, Yes lost its vocalist and faced its future with a big question mark. Anderson quit to work with Vangelis and move further into New Age music (just to come back, three years later, with his tail between his legs). Rick Wakeman, the keyboard virtuoso, also left the band again, for the second time, after noticing that the last two albums were trashed by critics and rejected by the public saleswise. Alan White, the drummer, stayed with the band, so did Steve Howe, the amazing guitar player. But there was more to come for this band in crisis, even though Chris Squire, bass player and founder, was shitting milk with rage. Enter the Buggles: Trevor Horn, guitar-vocalist-producer and Geoff Downes, keyboardist. The Age Of Plastic, released in 1979, put them in the spotlight of the new wave with that sweet single called "Video Killed The Radio Star." 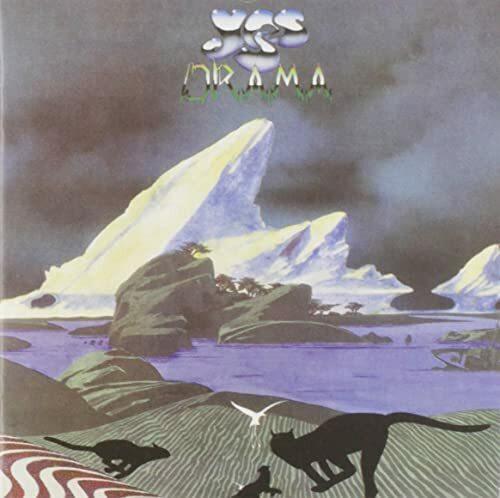 Trevor Horn presented a track to Chris Squire... and he was hired immediately as the new vocalist for the next Yes album and tour. He was needed, come on. Drama was skeptically received by fans. They actually were expecting a better album than Tormato, but with the same classic line-up of Anderson, Squire, Wakeman, Howe and White. What they got was a warp into the new wave, an update just like Pink Floyd's with The Wall in 1979. Yes, like the Floyd, were no longer dinosaurs, damn it -Now they are, sorry. The 1980 Yes tour was a total sold out and it's still the top grossing tour the band ever had. Thanks to Trevor Horn (who's a top-of-the-line producer) and Geoff Downes who helped with his synthesizer to update the band and make it more approachable to what people's ears were listening to in those days. Drama was the combination of Squire, Howe and White's experience and the freshness and vision of Horn and Downes. It was a volatile mix that wouldn't last more than six months, but hey, it worked and we love to hear it over and over. In vinyl, it couldn't sound more amazing. Drama passed the test of time and now it's a classic album. I still remember a friend of mine, back in college, who admired this record as the greatest 80's LP. I can agree with him if, and only if there weren't so many good records released after 1980. It is, however, a landmark in sound production, sending us into the amazing landscape Roger Dean painted for the cover and which is now exhibited at the San Francisco Art Exchange Gallery (458 Gearty Street, San Francisco, CA). included here. According to Iñaki Gorraiz, spanish filmmaker: "Trevor Rabin, the new guitar player, saved the band." The title refers to the catalog number and, if they weren't creative titlewise, they did an excellent job with "Leave It," setting the sound ready for something called... MTV. Big Generator (Atco, 1987): According to Javier Moreno, peruvian music buff: "Yes, he saved the band. But Big Generator is the first approach to the cheesyness Yes would be experimenting in the nineties. Thanks to Rabin and Anderson's bucolic vision of life. Key track: "Shoot High, Aim Low." Union (Arista, 1991), Talk (Victory, 1994): Unnecesary Yes, these records are either a no-no or a maybe. The first one was an attempt of cheating on the audience trying to make them believe that the nine most important members of Yes were playing together. Actually, there were more extra session musicians than in any other Yes record. Shame on them. Talk is plainly boring.